When you hear Paso Robles wine country, you think Zinfandel and Rhone varietals. But, the York Mountain area lies west in the Templeton Gap where maritime influence reaches far enough inland to produce cool microclimates and creates an ideal growing region for Pinot Noir. Foggy mornings, warm days and cooling afternoon breezes suit Pinot Noir just fine. Adelaida Cellars and its historic HMR Vineyard (planted in the early 1960s), and Windward Vineyard have produced some very credible Pinot Noirs from this region. Still others, including Bianchi Vineyards, Casa De Caballos Vineyards, Wild Horse Winery & Vineyards, and York Mountain Winery, have made Pinot Noir fanciers take note. 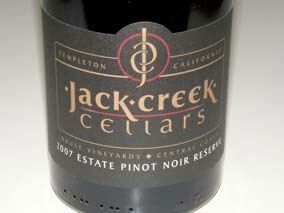 The latest kid on the block is Jack Creek Cellars. You won’t meet another couple who are more passionate about Pinot Noir than Doug and Sabrina Krause. Doug is a burly, lumberjack-like figure with a soft spot for Pinot Noir. He was in the grain feed business in Southern California and acquired enough financial resources to start his own winery. He sold his business and bought the front 75 acres of JRK Ranch located in Templeton, 7 miles inland from the Pacific Ocean. The site is located at the southern end of the Santa Lucia Mountain Range. In 1997, he planted 20 acres to Pinot Noir (115, 2A, Pommard), 4 acres to Chardonnay, and a little to Syrah. Recently, he has planted more Pinot Noir (Dijon 828 and 943) and more Syrah and Grenache. Doug is not shy in admitting he prefers a bigger style of Pinot Noir. He produces two Pinot Noirs: an estate bottling that is more traditional for California and a reserve bottle that is fat and opulent. He says that his customers are split - about half preferring the regular bottling and half relishing the reserve bottling. Jack Creek Cellars is located at 5265 Jack Creek Road, Templeton, CA (just off Hwy 46, a short drive from Hwy 1 or Hwy 101). Tasting by appointment. The phone is 805-226-8283. Wine may be ordered on the website. The Syrah is one big fruit bomb and deserves attention for those with a Rhone bent.